David Beckham in his best Bond pose in front of an oncoming Tube train. He's not worried about his possible demise as he nonchalantly holds his Motorola Razr 2 (top name) with pride. Like the MacBook Air, it's so slim you can hardly see it. The blood-red slash of the 2 behind the Razr looks like it's battled its way through the film 300. This ad is ticking a lot of boxes on the London Underground effective advertising checklist. 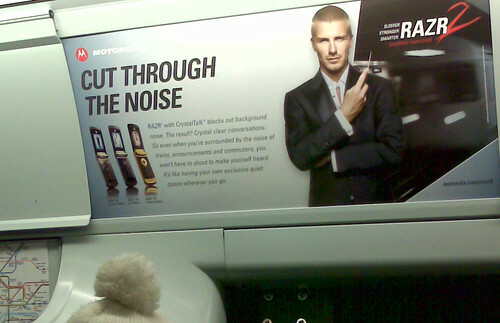 "Razr with CrystalTalk blocks out background noise. The result? Crystal clear conversations. So even when you're surrounded by the noise of trains, announcements and commuters, you won't have to shout to make yourself heard. It's like having your own exclusive quiet space wherever you go." Whatever you think about mobile phones on the Tube, that's genius copy. It's elitist. It's confident. It's male. It's sooo London. And, before anyone asks - no I wasn't paid by Motorola, or any of their agencies, or David Beckham. My old Nokia 3510 is a source of hilarity in the office, but I'm very happy with it. 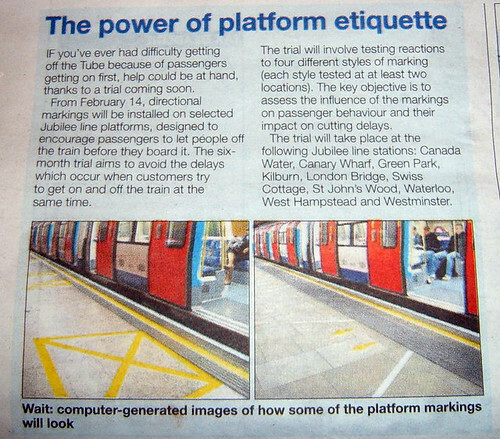 Sort of related to the earlier post about tourists knowing how to get in the way on the Tube, TfL are trialling "directional markings" on platforms designed to encourage passengers to let people off trains before they get on. So it's not just tourists that cause Tube commuting snarl-ups. You'd have thought it was common courtesy to let people get off before you get on, but it's a bugbear for a lot of commuters. 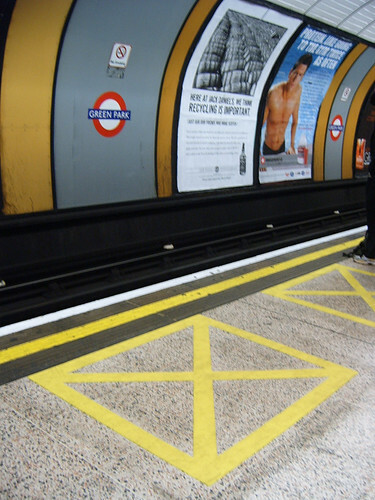 From February 14th, platform floor markings will be installed on selected stations on the Jubilee Line, including Green Park, Waterloo, Westminster, Kilburn and London Bridge. They'll be testing the reactions of four different styles of markings to see how they influence our behaviour when boarding trains, and the impact this will hopefully have on reducing delays. So look out for the markings and let's hope they work. Also if you have your own ideas about what sort markings might help (two of the four in trial are pictured above), it'd be good to hear them. 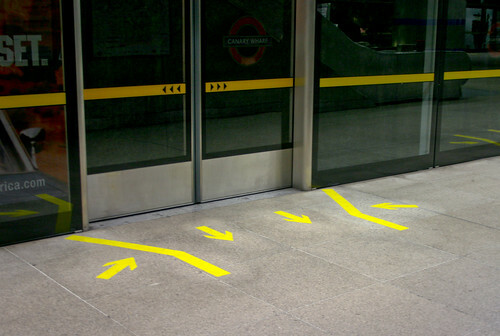 Phill Price has a shot of the markings at Canary Wharf - thanks for letting me know! If anyone has a shot of the others please send them in. Also the ever wonderful b3ta had a map challenge last week where people were challenged to create a map that told the truth. 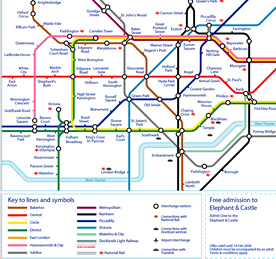 Not surprisingly there are many re-creations based on the London Underground Map. One of my favourites for tourist confusion was this as I initially just focused on the free admission to Elephant & Castle on the bottom right. But with closer inspection you'll see why I like it. Although it's not as well executed I also enjoyed the more truthful central London for tourists. In my opinion this tourist's A-Z below wouldn't be needed, as tourists seem to inherently know how to get in the way on the Tube. Check 'em out before TfL's solicitors take on b3ta to try to get them pulled. Who's your favourite Tube busker? 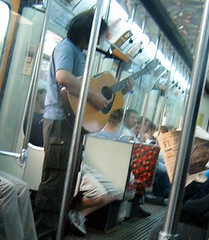 I've never personally known someone who busks on the London Underground, even though I felt like I knew the much missed "if you can't have a shave in the toilet where can you have a shave" buskers. So it was with some delight last week, that a blogging friend of mine, Lloyd Davis, casually mentioned that he busked on the Tube. "What you're joking? Seriously you must tell me about it", I screamed. Rather than grill him too much over dinner, I'm going to interview him and you can learn more about what it's like to busk from the horse's mouth very soon. First a warning. You’ll need to register (grrr…) here in order to enter, but you can opt out of getting too much crap from them. You’re all grown-ups and you can decide what to do with your personal data. I will understand if you feel this is too much to ask." There's a interactive map on the site and you can use a slider to remind yourself who busked when & where (or if you really want to plan a busking day out). You have four weeks to vote for your favourites and can vote once a day. Feel free to leave a comment here about any buskers you love or particularly hate. Great London Underground Tube car Line diagram by perfectrhys. It was in response to one of b3ta's recent challenges. Nicely sums up actions & thoughts that may be going through a driver's head on your journey. There's more at the end of the line so click to see in full size. Many thanks to London Lass for sending this through, as it "looks" as though there's something to hide about the trains on the Central Line. Basically, a friend of hers had been getting very perturbed about the cancellation of a lot of his trains pre Xmas and wrote to London Underground's customer service department. Her friend got a remarkably candid email back about motors overheating, smoke coming out of trains and stressing that this "doesn't present any danger to customers". Obviously, they are sorting out the over heating problems and taking out trains to check them. They wrote: "As you can imagine this has meant train cancellations, resulting in customers having to wait longer than usual on occasion. The last thing we wanted to do was to alarm people unnecessarily, hence this hasn't been publicised." Much as I applaud their honest email (in full here), surely there is some way they can alert regular commuters to this without causing widespread panic & alarm? Even if they said something like: "You might have noticed that your Central Line service is a bit more rubbish than usual, but we're doing all we can to sort it out, blah, blah, blah". It would have at least acknowledged there's a problem without necessarily saying: "You might have noticed smoke coming out of the bottom of your trains but don't worry that's nothing to worry about". Commuters aren't stupid and London Underground are well aware that journalists, bloggers and other mouthy people will write about their bad experiences. "My stretch of the London Underground has been awful for weeks, as a fellow-passenger and I agreed mid-week when our train waited at Hammersmith station because - so the driver announced - we had ''arrived a few minutes early''. Early? They do early? It is only the second time in 40 years I have heard that excuse." Trains being held up because they're early? Not wanting to unduly worry us because our trains are smoking? 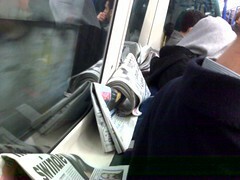 Isn't it time for the Tube's press & communications department to put a bit more thought into their work? How can you balance people like drivers and customer service reps being human and making ad-hoc comments, with a much wider responsibility to the public? 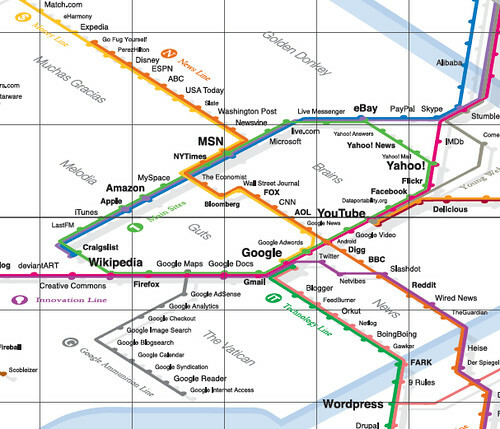 The guys behind the design agency said "This time we've taken almost 300 of the most influential and successful websites and pinned them down to the greater Tokyo-area train map. By popular demand, we enlarged the poster size from A3 to A0." Like all good betas they are asking for suggestions and improvements to make it better and you can even submit influential companies which you think they've left off, before they print the poster version. Last year I predicted that twitter would be on the later version, so it's no surprise to see it there. However, I was surprised and interested to see blogs like Perez Hilton & Go Fug Yourself appearing on the end of the News Line not far behind ABC and USA Today - the influence of celebrity bloggers is strong. Even Fake Steve Jobs makes an appearance. One of the commenters says "The folks at eBay's Toys building have an enormous (about 4′ x 8′) copy of last year's map up in their space." It certainly will make for an interesting poster and I'm looking forward to seeing it come out of beta. 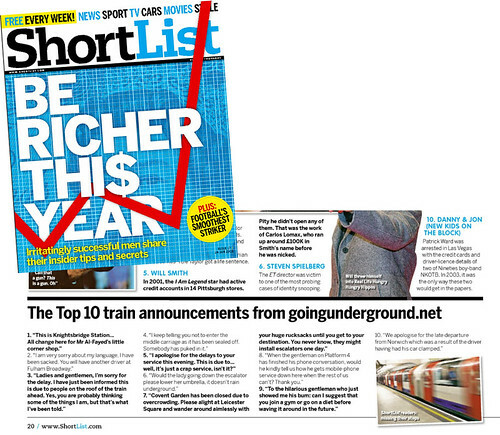 Thanks to Shortlist Magazine for picking out some of the London Underground driver's announcements and featuring them in yesterday's issue. Welcome if you made your way to blog from there. Shortlist is another free magazine handed outside of Tube stations. 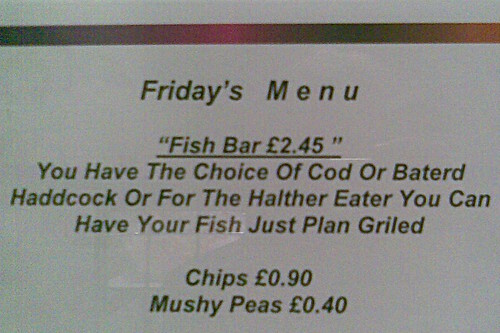 But this is a weekly available on Thursday mornings. I had to ask for it when it first came out, as it's a "men's" magazine. The handing out person always used to look at me as if I was really weird, but it seems their policy's changed now and they're happy for women to have them. Luckily they don't have that manic freesheet distributor stance of others I could mention. I spend much less time updating the overheard driver's announcements now, but it's good to see people are still interested in them, and still send them in. If you've heard any funny ones recently feel free to leave them and I'll try to get around updating the site. Just make sure they don't get hold of the spelling on the platform indicators. Who's afraid of the big bad Oyster? 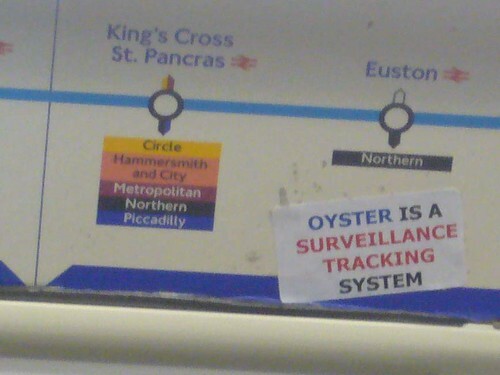 Am I the only person who's not bothered about having my journeys on the Tube "monitored" by having an Oyster Card? "For example, you now must buy an Oyster Card if you wish to buy a monthly travelcard for London Underground, and you are required to complete a form giving your name, home address, phone number, email and so on in order to do so. This means that Transport for London is amassing a radioactive mountain of data plutonium, personal information whose limited value is far outstripped by the potential risks from retaining it. "Hidden in that toxic pile are a million seams waiting to burst: a woman secretly visits a fertility clinic, a man secretly visits an HIV support group, a boy passes through the turnstiles every day at the same time as a girl whom his parents have forbidden him to see; all that and more. "All these people could potentially be identified, located and contacted through the LU data. We may say we've nothing to hide, but all of us have private details we'd prefer not to see on the cover of tomorrow's paper." Much as I love over-exaggeration, hyperbole and weird metaphors, I'm seriously struggling with this concept. How on earth can a person's actual final destination be located by the station they end up at? I travel to Leicester Square Tube station every working day. Transport for London, or indeed anyone who gets access to my Oyster Card data, has no idea what I do after I reach Leicester Square. I could be going to one of the many thousand of premises that are a short walk from Leicester Square. Whether I secretly go to a knocking shop, a liposuction clinic or furtively buy a BigMac, none of those things are going to be discovered by my Oyster Card usage. The only group of people who could potentially do me harm by knowing my travelling habits are enterprising burglars. They could use it to tell I was at work all day and not at home, but I reckon it's far simpler for them to keep an eye on my house, than steal data from TfL. A kissing couple are to sue Shanghai Metro after CCTV video footage of them was uploaded to Ku6.com and YouTube last week. Within two days, it received more than 15,000 hits (it's now at over 400,000). The man recently resigned from his job from embarrassment after receiving calls & comments from relatives and friends. "Now, every time I walk into a metro station, I feel very uncomfortable," he said. "We think employees of the metro station taped us illegally and made negative comments. What's worse, they uploaded the video to the Internet, which has infringed on our rights". "This has to do with the protection of the legal rights of all passengers traveling on metro trains in Shanghai, and not simply our own interests and damage it has done to us." Hopefully, this won't give employees from TfL any ideas for uploading "spy cam"/ "funny" / "intimate moment" commuter videos onto YouTube. The use and access of CCTV footage in the UK is regulated under data protection legislation. When is Leicester Square going to get some ads on the westbound, Piccadilly Line platform? I took the picture above in October and it's still like that now. As much as some people don't like London Underground ads, surely anything would be better than this? There's loads of ads on the eastbound platform, so what's wrong people who are Heathrow or west London bound? The new ones had better be worth the wait or perhaps we'll be getting something more hi-tech, like some projected cross platform ads. I don't know the results of the test at Euston last October, but apparently: "The replacement of cross-track bill posting will bring significant environmental benefits with a reduction in paper and paste, which renders the paper adverts non-recyclable. Around 4.1 tonnes of waste per year will be saved from landfills." 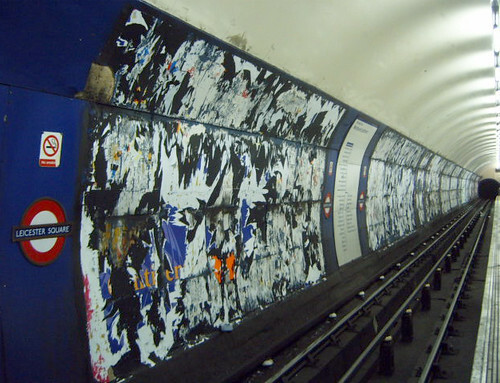 CBS Outdoor who look after ads on the Tube, said that once the testing was complete if the conclusions were "satisfactory", "The new technology will be rolled out across 24 major London Underground stations with 150 units to be installed from early 2008." Let's hope that's why Leicester Square's been adless for months. If like me you're trying to travel between Richmond and Turnham Green or using the London Overground in the same area, you'll have to find another route in this morning. Vandals have been ripping up the tracks at Gunnersbury again today stealing copper! So if you see any large lumps of copper for sale on e-bay later, you'll know where they came from. Check out the Tube's site for updates. Fortunately the publishers of London Lite, the londonpaper and Metro have decided to put their money where their mouths are and honour their commitment to do something about the "freesheet mountain". Last month it came to light that on just three lines of the London Underground alone, nine and half tonnes of free newspapers are left behind every day. Now 35 re-cycling bins have been installed in the West End and Victoria at a cost of £500 each. I saw one outside Leicester Square Tube on Friday. News International (which publishes the londonpaper) has taken responsibility for the bins in the Oxford Circus and Charing Cross Station areas, while Associated Newspapers (Metro & London Lite) is looking after Leicester Square and Victoria Station. 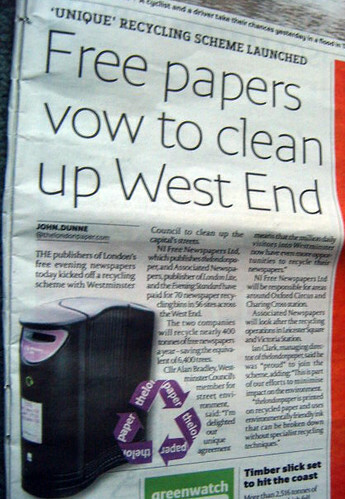 Westminster Council threatened to restrict distribution of the papers within its boundaries if a commitment was not made to help the increased clean up bills the Tube and others were facing. The Council expects the scheme to ensure the emptying and recycling of nearly 400 tonnes of free newspapers each year, the equivalent of 6,400 trees. Thanks to Mark R who's been an "American lurker-reader for years" for letting me know that the new Chronicles of Narnia movie Prince Caspian has a opening sequence based on the old Strand London Underground station. The special effects for the film look great. I particularly like the part where a Tube zooms past and the children see the technicolour world of Narnia coming out from the windows inside. The outside shots look like they're trying to re-create the Strand at Charing Cross and it would be with ironic if the inside was filmed at the Strand at Aldwych. A number of movies are shot at the now closed Aldwych, when a Tube station needs to be created, but with a Walt Disney budget, I'd imagine that an entirely new set was built. Hopefully a Leslie Green or retro London Underground station architecture expert will be able to prove me wrong or right! You might wonder why people would want to buy portable strap hangers. It's not to stimulate the experience of subway travel in your home. It's not a strange new underground exercise. The strap hangers are designed for male commuters to have something in their hands, so that they're not accused of groping women on the subway! Apparently the straps which retail at 525 yen (about two pounds fifty) are selling like hot cakes. 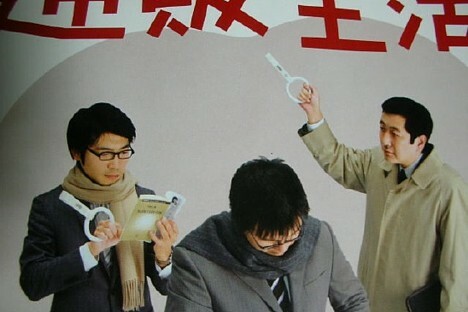 Groping is such a common occcurance in Tokyo that men feel the need to make it clear they have something else in their hands. What's wrong with a book or a newspaper? I happened to be watching The Best of The Graham Norton Show last week and caught the actress Miriam Margolyes telling a story about how she once had a man pressing his erection in her back when she was on the Tube. Being Miriam Margolyes, she didn't keep quiet about it and managed to embarrass him in front of the whole carriage. An old colleague of mine also has a dinner party story where a man put his hand on her derrière on the Tube. She lifted it up and said loudly, "Does anyone know who this belongs to? As it seems to have become attached to my arse?" Fortunately that's about as much as I've heard about London Underground groping or the likes recently. So either it doesn't happen much or no one talks about it. Let's hope it's the former. "Like a beast released from Aldgate East", Anthony The Dustmasker's Tubechallenge lyrics have never sounded so appropriate, as gamers can now salivate or moan about Hellgate London. "A post-apocalyptic London has been overrun by hordes of terrifying demons, leaving the city desolate and scorched by hellfire. Those who were unlucky enough to survive now gather in the only sanctuary left, the Underground, banding together in order to gain a foothold against the minions of darkness and ultimately save the bloodline of humanity." 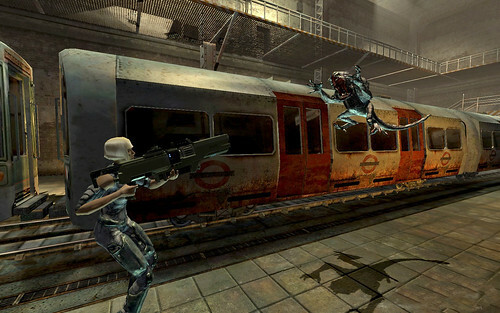 I know these are "fantasy" games, but I would love to see something where people were kitted out to destroy demons with "weopans" and helped by "factions" that you'd be more likely to find on the Tube. The Buskars would be mysterious, highly trained ex-buskers who lay waste to their foes with hyper-advanced instruments, amplifiers and boom-boxes that blend theoretical science with the latest in technology – and ear piercing notes can sink demons from almost any distance. They'd be joined by London-Lite'ists - students of the dark arts of free-sheet thrusting. Their skills often leave them standing right on the line between good and evil. Their combination of fast-moving arm action with a solidly immovable stance make them highly suited for mid-range combat. Finally, the Rattus Pigeonars, a secret society of in-bred creatures that finally stepped out from the tracks of the underground and bonded with humans in a bid to conquer the demons. The Rattus Pigeonars mix futuristic technology with ancient techniques of scavenging to create powerful weapons and armour out of soft drinks cans and discarded chocolate bars, perfect for short-ranged attacks. Put them into a game and I'd be all over it. If you can think of any other factions, armour and weoponary that would help in a more realistic Hellgate London, feel free to do so below. Tube Lines have got all Web 2.0'fied and have launched a channel on YouTube starting off with a promotional video on the "future of travel on the Jubilee, Northern and Piccadilly Lines" and the ins and outs of the signalling system. This is one of those occasions when you wish Emma Clarke was still in favour with TfL as the woman they use for the voice-over seems to be pitching at five year olds. Her over-pronunciation of certain words and the general speed of her voice (it seemed way too slow) drove me mad. Although maybe it is aimed at school children. Thanks to Pedro for alerting me to the channel and if Tube Lines really want to embrace YouTube, perhaps we'll see videos added of dogs on skateboards going down Northern Line platforms or more escalator ski-ing at Angel. Or perhaps not. If you think the gaunt miserable face behind the controls of this London Underground train looks more than a little familiar, you'd be right. Mackenzie Crook better known as Gareth from The Office or Ragetti from Pirates of the Carribean was spotted in December last year at East Finchley Tube station filming a new Brit rom-com with the working title of "Three and Out" which will be on our screens later this year. He plays Tube driver Paul Callow in a comedy about "ordinary people with unique dilemmas caught up in a cocktail of desperation, friendship, loneliness, love and even a brush with cannibalism". Just your average day on the Northern Line then (well, without the friendship or love or cannibals, I spose). As a Tube driver, the character finds himself mixed up in a series of unlikely scenarios after accidentally mowing down two people on the track! 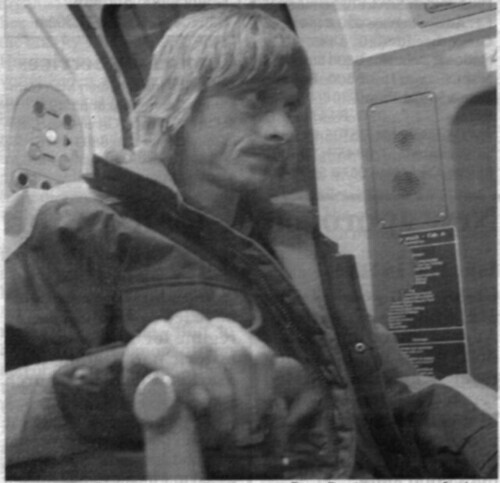 Not sure whether he actually gets to drive the train but regular commenter Jon who sent in the clipping said of the filming "they didn't do it when the station was closed so the ruddy film crew got in everyone's way and I was an hour late." 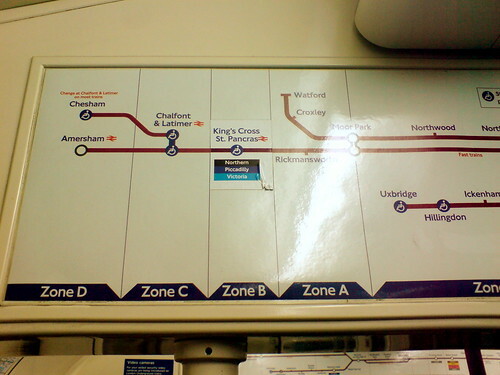 Charing Cross Tube station was also used for filming. If I hear anything more about the release I'll keep you posted and if you see any local filming at Tube stations let me know. Update - It's out on 25th April 2008 and rail union ASLEF's general secretary is none too happy about it. Many Happy Returns to the Tube. On the 10th January 1863 the world's first ever public underground line opened. The Metropolitan Line had trains running every 10 minutes and carried 40,000 passengers between Paddington and Farringdon that day. "It appears that arrangements have been made for opening this line on the 10th [of January] for public traffic, but as the 1st of October, the 1st of November, the middle of December have been announced from time to time as the probable date of opening, it is presumed that no one will feel disappointed if a further postponement should take place." The Times sceptically reported. "Of the general comfort in travelling on the line there can be no question, and the novel introduction of gas into the carriages is calculated to dispel any unpleasant feeling which passengers, especially ladies, might entertain against riding for so long a distance through a tunnel." Mmm, gas in carriages? I don't look forward to people letting off gas in Tube carriages, but glad that the London Underground were conscious of us gentle ladies travelling around. Using the classic station-soundalikes "Whitney Euston" and "MC Hammersmith" and following up with the not so classic "Lily Balham", "Eric Clapham" and "Iggy Poplar" (only popular enough for the website) - the pun-tastic singers' names are gracing posters and the website for the "set-up-Oyster-auto-top-up-and-get-five-free-iTunes" offer. 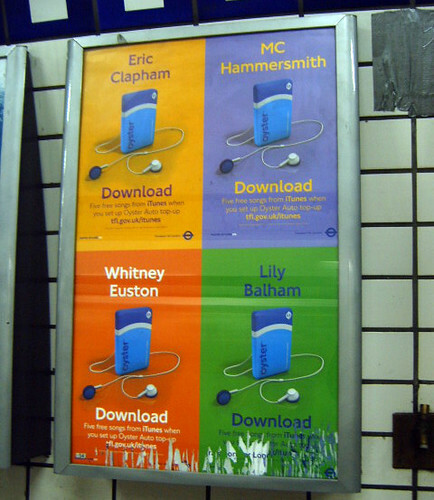 There were a number of singers when you came up with the suggestions before, but since the summer of 2005 (when Lily Allen was barely more than Keith Allen's daughter) there must be more bands and artists that share their names London's stations. Feel free to suggest away - remember to use as much artistic licence with the names as TfL have. 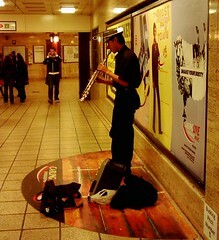 Expect to hear more classical music on the London Underground and not just from buskers on harps or wind instruments. A trial of playing classical music in station ticket halls, which began on the District line at Elm Park in 2003, has apparently become so successful that it's being extended to 40 stations with more to be introduced. "It was part of a number of measures at the time to deal with anti-social behaviour, which included extra CCTV cameras, additional policing and playing classical music," said a spokesperson from London Underground. "We had fairly anecdotal feedback from customers saying how much they liked it. People found the music relaxing and calming. The playing of classical music was part of a package to improve the ambience of stations." I've only ever heard piped classical music once on the District Line at Gloucester Road about three years ago. When I asked the station assistant about it then, he said it was just a compilation that one of the guys had done from his computer. However, stations are now being supplied by a contractor with 40 hours of programming using MP3 players. Popular composers are Beethoven, Vivaldi and Rachmaninov. The Financial Times reported that "A survey by Transport for London of more than 700 travellers found they overwhelmingly agreed that hearing classical music made them "feel happy, less stressed and relaxed". So listen out for the music and let us know if you've already heard some. Plus if you see any hoodies legging it from stations holding their ears, screaming "No more bloody Beethoven", that might give you a clue that the music's made it to your station. 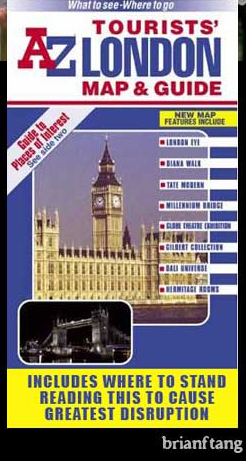 If you look at the new cover of the pocket London Underground map, you might think that Transport for London are trying to delve into your inner psyche. 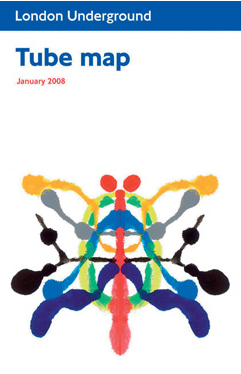 The new design which will be gracing our map covers for the next six months is by Cornelia Parker (the English sculptor known for blowing up a shed and arranging the fragments in a large room) and takes the form of a "Rorschach Ink Blot", which psychoanalysts use to map out their patients' emotional states. You know the drill, "look into this blot and what do you see?" As well as using the colours of the Underground lines, according to TfL, "Passengers will begin to recognise many other shapes and forms in the artwork and can while away their journeys making these visual associations." I can clearly see a man in a Samurai mask more than anything else. From this psychoanalysts could deduce that I see travel on the Tube as a constant battle. Although I can imagine a lot of people will see a butterfly, which could be interpreted as having a rather transient approach to travel. Any other images seen are welcome in the comments and I'll have a bash at interpreting them (although bear in mind I dropped my psychology A level studies after a few months)! This may or may not have anything to do with the Tube, but a number of people have sent me an email now asking whether I could help solve this picture puzzle. 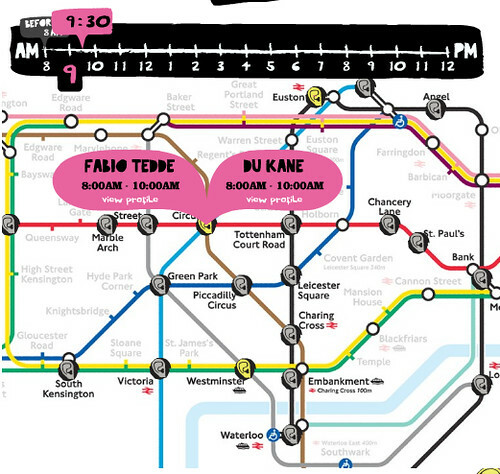 It certainly looks like it might be part of the Tube map, but wouldn't bet my life on it. 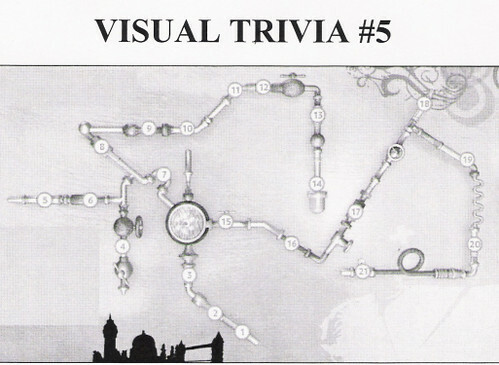 If any of you have any ideas, or think you know what it's relating too, it would help the guys doing the quiz.